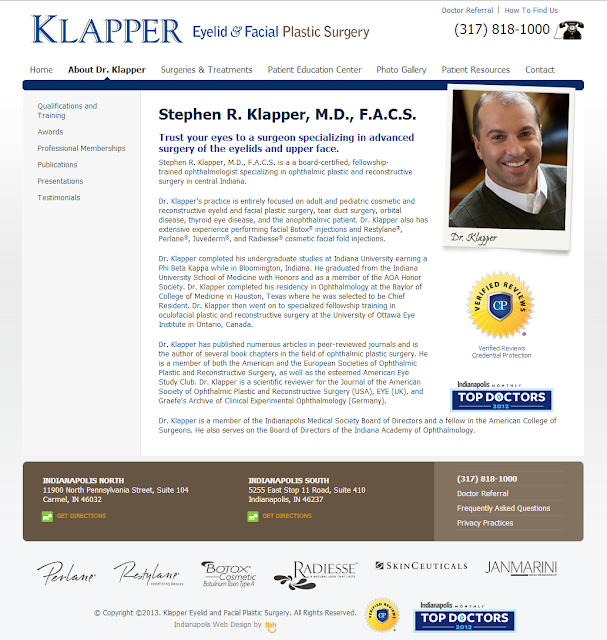 We launched a new website for Klapper Eyelid & Facial Plastic Surgery. You may view Dr. Klapper's new website at klapperplasticsurgery.com. We started working with Dr. Klapper in 2010. At that time his current site was confusing to navigate and difficult to update. We helped Dr. Klapper organize the information for his prospective audience by clearly dividing his offerings into two main categories - description of his services and patient education information about the problems they may be having. The addition of impressive photos showing patients before and after procedures highlighted his services and ability. Dr. Klapper's previous website was a static website that was difficult to manage or update. We created a custom application allowing Dr. Klapper and his team to easily add new services, photos, and all information on the website. TBH Creative has assisted Dr. Klapper with general marketing from brand development, domain management, social media set up and general marketing advice. We continue to work with Dr. Klapper on his search engine optimization to get the most from his newly designed website. Stephen R. Klapper, M.D., F.A.C.S. is a a board-certified, fellowship-trained ophthalmologist specializing in ophthalmic plastic and reconstructive surgery in central Indiana. His practice is entirely focused on adult and pediatric cosmetic and reconstructive eyelid and facial plastic surgery, tear duct surgery, orbital disease, thyroid eye disease, and the anophthalmic patient. Additionally Dr. Klapper also has extensive experience performing facial Botox® injections and Restylane®, Perlane®, Juvederm®, and Radiesse® cosmetic facial fold injections. TBH Creative is an Indianapolis web design company offering full service solutions and web strategies to businesses. Dr. Klapper's office is one of many healthcare web designs we have successfully completed.